A.G. Alfieri, (not to be confused with Officine Alfieri), was an Italian automotive manufacturer based in Milan founded by by Giuseppe Alfieri with operations from 1925 through 1927. The company existed for only two years and despite its extremely short life span, it entered automobile history with the realization and implementation of independent suspension on their cars. 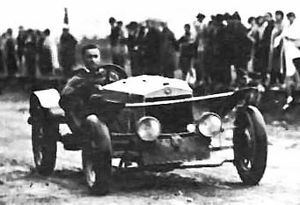 Alfieri designed two cars, 1925 the Tipo 1 sport with 4 - an cylinder Chapuis Dornier engine and 1927 the Tipo 2 sport. This car differed from the Tipo 1 sport with a different front wheel suspension and the Scap engine with a Cozette compressor, which produces 20 HP.